WIIRE and Masumeen Islamic Centre (MIC) hosted a successful Muslim Unity Seminar on January 18th 2015 to commemorate the birth anniversary of Prophet Muhammad (S.A.W.). The topic of the seminar was “The Noble Prophet (S.A.W.) and the Muslim Ummah” Speakers from Sunni Muslim and Shia Muslim enlightened the participants with the teachings of Prophet Muhammad (S.A.W.) and the importance of Muslim Unity. The objective of the Muslim Unity is to create an environment of collaboration and communication among Muslim organizations on issues of interest to Muslim Canadians nationally as well as on the international front. In addition to the eloquent speeches, the seminar also had spoken words and poetry and they were very inspirational. The spoken words and poetry propagated the message of harmony, hope, spirituality, unity and cooperation in an intellectual and creative way. The Muslim Unity seminar ended with participants holding hands of each other and reciting Dua-e-Wahdat (supplication for Unity) among the Muslim Ummah. Paving the way for unity and solidarity in the Muslim world; this is the main objective of the 25th International Islamic Unity Conference held in Tehran. The three day event which is held by the World Forum for Proximity of Islamic Schools of Thought also aims at revising the forum's performance during the past two decades. Iran's President Mahmoud Ahmadinejad addressed the opening session in the presence of recognized Shiite and Sunni scholars. The President pointed to many political issues related to the Islamic world. The Islamic unity conference provides an opportunity for scholars to share views and review problems facing Muslims while presenting solutions. A big part of the conference revolves around the topic of Islamic Awakening and the popular uprisings in the Arab world. The World Forum for Proximity is an international organization founded by Iran. Its main aim is to create more unity and solidarity among Muslims worldwide, regardless of their Schools of Thought. Lebanon\'s resistance movement Hezbollah has called for national unity to avoid the destruction of the country. Hours after a terrorist bombing in Beirut, Hezbollah\'s Deputy Secretary General, Sheikh Na\'eem Qassem has warned that the country cannot be saved without a political understanding. Qassem called for the speedy formation of a national unity government to face the criminal attacks across Lebanon. Iran and Syria have also condemned the bombing and called for the punishment of terrorists and their supporters. The powerful car bomb explosion in southern Beirut left several people dead and dozens injured. Islamic Unity is a principle of Islam that needs to be comprehended properly. 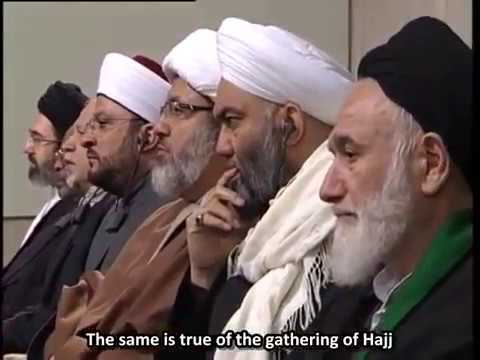 What is one of the natural outcomes of the Islamic Unity? The Leader speaks. Determination for Unity VS Determination for Division Leader of the Muslim Ummah, Imam Khamenei, highlights the war between two fronts; one is pushing for unity between Muslims by stressing upon the commonalities; and the other pushing for division by stressing upon the differences. Which side are you on? There is no middle ground here!